The Northeast is going to have to step it up if states want to meet their admirably ambitious goals to reduce greenhouse gas (GHG) emissions to roughly 80 percent below 2001 levels by 2050. 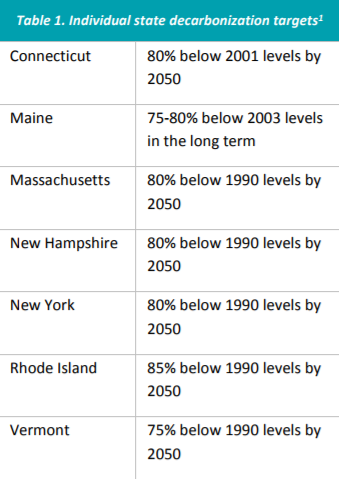 While the seven states in question—Connecticut, Maine, Massachusetts, New Hampshire, New York, Rhode Island, and Vermont—had by 2015 managed to get their GHG levels down by 19 percent, the approaches they’ve been using won’t be enough. Enter strategic electrification—an approach increasingly recognized as an essential and cost-effective part of deep decarbonization. Basically, it means switching non-electric energy consumption such as transportation and oil- or gas-based heating to electric technologies when it is technically and economically feasible. The seven states signed on to their respective GHG reduction targets between 2001 and 2014. Their individual state decarbonization goals can be found in Table 1 below, with reductions ranging from 75 to 80 percent. Energy efficiency and carbon-free electricity, two of the most commonly discussed approaches to GHG reductions, can only reduce Northeastern emissions by about 40 percent of 2001 levels, leaving the states approximately 40 percent behind their goals. The remaining 40 percent must come from direct fuel use in sectors such as transportation and heating. 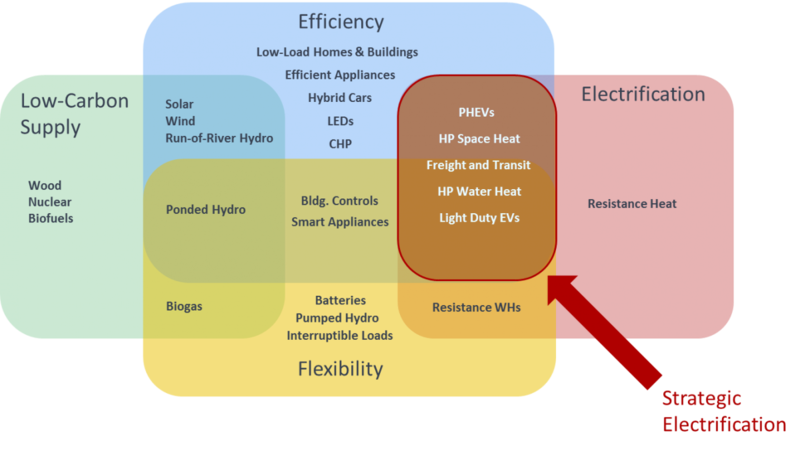 Northeast Energy Efficiency Partnerships’ Northeastern Regional Assessment of Strategic Electrification (July 2017), authored by Synapse Energy Economics and Meister Consultants Group, explores strategic electrification approaches to meeting the goal and the ways in which policies can aid in electrifying essential end-uses while taking into account the state of technology and markets as well as impacts on the electric grid. 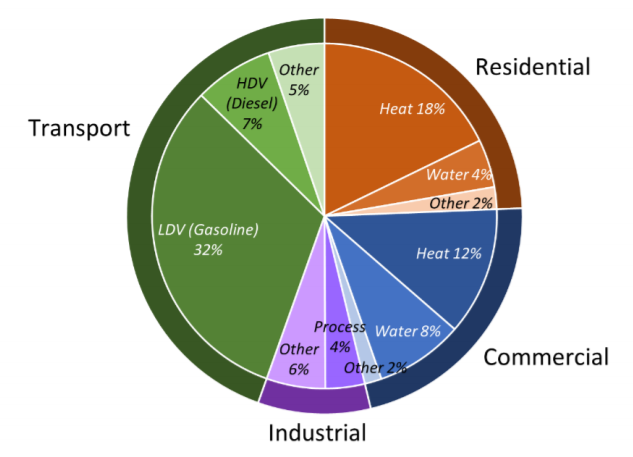 Of the 4.2 quadrillion British thermal units (BTU) of fossil fuels consumed annually for direct end-uses in New York and New England, 85 percent serve just a small handful of purposes: residential and commercial space and water heating, industrial process heat and steam, and on-road vehicles (see Figure 1). To meet their GHG reduction targets, the states must strategically electrify these end-uses. Figure 1: Direct fossil fuel use totals 4.2 quadrillion BTUs in New York and New England. Just a few end-uses dominate that consumption. The report defines strategic electrification as “powering end-uses with electricity instead of fossil fuels in a way that increases energy efficiency and reduces pollution, while lowering costs to customers and society, as part of an integrated approach to deep carbonization.” The diagram below illustrates the overlap between efficiency and electrification that characterizes strategic electrification. Heat pump, electric vehicle, and other electrification technology adoption must increase quickly for the Northeastern states to stay on track for their GHG goals. For example, even a scenario with EVs and heat pumps representing more than two-thirds of new cars and heating systems adoption by 2035 will require some fossil fuel combustion to be displaced by bioenergy instead of electricity to stay on track for the 80 percent reduction. Electrifying the region’s heating needs will also drive shifts in the electricity supply markets. Depending on how heat pump loads are managed, the region as a whole could become winter peaking by the mid 2030s. 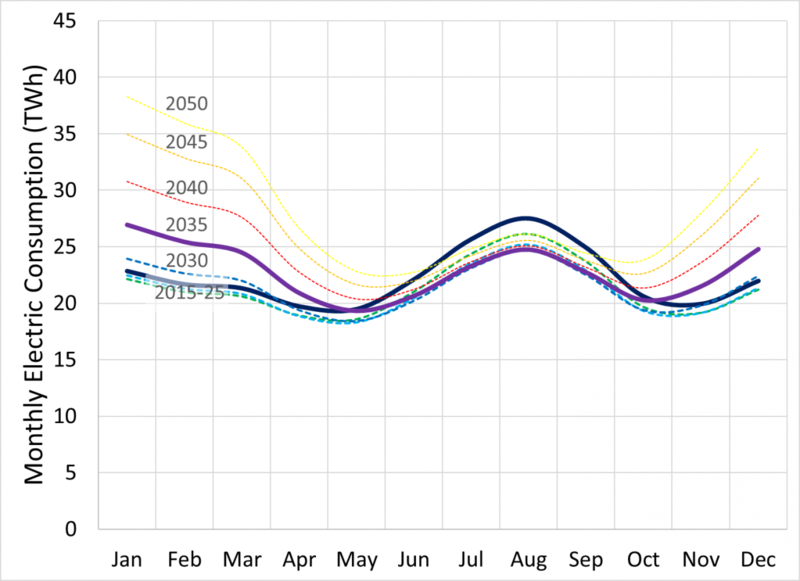 The “butterfly curve” below shows this changing annual dynamic between 2015 and 2050 as the region electrifies. In this scenario, January consumption exceeds August consumption starting in 2032. Meeting this fast pace will require policy and program actions for near-term market acceleration. At the same time, the report identifies new policy questions that must be addressed as adoption of electrification technology increases. Implementing pricing-based options, such as new electric rate structures and the pricing of externalities (such as carbon pricing). What role(s) should electric distribution utilities and regulated energy efficiency programs take in electrification developments? What rate structures should be adopted to help promote strategic electrification? What is the right balance between biogas and electrification for current gas uses? What is the future of the natural gas utility pipeline networks and business models? Implementing effective programs and policies will be critical to achieving the region’s 2050 targets. As technologies and policy landscapes evolve, Synapse will continue to research these issues—crunching numbers, studying policies, and facilitating discussions. We look forward to working with the many parties involved in advancing the Northeast’s emissions reduction goals.